The existence of Area 51, the US airbase rumoured to house UFOs, along with details of some of the strange activities that went on there have been officially acknowledged in newly released CIA documents. Its existence has been a badly kept secret for decades and it has fuelled the imaginations of conspiracy theorists and UFO hunters around the world. Now the existence of Area 51 has been officially acknowledged by the Central Intelligence Agency and its exact location revealed in Nevada. Documents released by the CIA also reveal that there really have been some strange occurrences at the secret airbase – however, they are not quite as exciting as UFO hunters would like. Among the jobs that staff at the site had to perform during the 1960s was a routine of vacuuming the runway to allow experimental aircraft to take off without damaging their engines. Previously the US government has provided minimal information about Area 51 and most mentions of it are redacted in documents that are declassified. Official maps usually only show a disused mine at the site or a large area of restricted airspace, however it does feature on Google Maps and in satellite images. However, in a set of documents released to a researcher studying the history of the U-2 spy plane program, the secret base is officially revealed. A line drawn map contained within the reports show the location of Area 51 and Groom Lake, the salt flat the base is built upon, in relation to the Mojave Desert. They also provide details on how the site was first established as part of a wider Atomic Energy Commission test site. However, the documents make no mention of UFOs nor the secret weapons that many believe are being developed there. Jeffrey Richelson, a senior fellow at the George Washington University’s National Security Archive who obtained the records, said the new documents seemed to suggest the CIA were becoming less secretive about Area 51’s existence. The documents were released in response to a Freedom of Information Request made in 2005. An earlier 2002 request resulted in documents that were heavily redacted. substantially less redacted version of a history of two key aerial reconnaissance programs. The mentions of Area 51 were contained in documents detailing the history of the U-2 and Oxcart spy plane programs were written in 1992 by Gregory Pedlow and Donald Welzenbach, who were historians at the CIA. A heavily redacted version of the seven chapter history was published in 1998 with a more detailed version released under the Freedom of Information Act in 2002. The latest version to be released shows that Area 51 is mentioned on at least 12 pages, including a map. One of the first mentions describe how two senior project staff on the U-2 project had been flying over Nevada when they spotted an old airstrip near Groom Lake. It describes how the facility had been used during World War Two as an aerial gunnery for the Army Air Corp pilots. President Dwight Eisenhower later approved “this strip of wasteland, known by its map designation as Area 51, to the Atomic Energy Commissions Nevada test site and training range. It then became central in the development of the U-2 spy plane. It also states that to make the facility more attractive to workers there, it was named Paradise Ranch, or sometimes the Ranch. A poor quality photograph of “The Ranch” is also included. The documents also mention how a Military Air Transport Service flight crashed in 1955 at Area 51 killing 14 people. They also provide detailed history about tests and missions of the U-2 plane from Area 51, along with information about the aircrafts use in other parts of the world. The documents reveal that British pilots were used to fly missions in the U-2 in an attempt to confuse the Soviets, but that tests on the aircraft and its successor, known as Oxcart, also seemed to be responsible for many sightings of UFOs. The document said: “High-altitude testing of the U-2 soon led to an unexpected side-effect – a tremendous increase in reports of unidentified flying objects. Radar tests of what would later become the SR71 Blackbird were also carried out with a mock up of the plane placed on top of tall pylons. Area 51 was later upgraded to assist testing of this aircraft under the Oxcart program. To transport the aircraft to the site in 1962, a specially designed 35ft wide, 100ft long trailer costing $100,000 was used. Road signs had to be removed, road banks were levelled and trees trimmed to help transport the plane safely – possibly providing an explanation for some of the phenomena attributed to UFOs in the area. There are some amusing mentions of life at the secret US base. 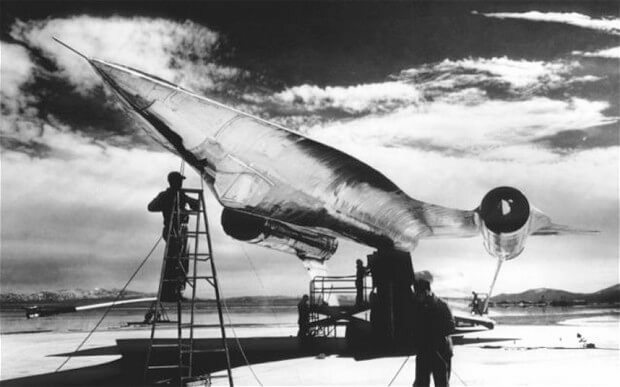 During testing of Oxcart in 1963, Area 51 personnel had to “sweep and vacuum the runway” before the aircraft took off to prevent damage to the engine. There are, however, some mentions of Area 51 that remain blanked out and this will doubtless provide more than enough fuel to conspiracy theorists. According to some conspiracy theorists, Area 51 has served as a research site for a range of exotic weapons and technologies. Most famously, it is said to be the US government’s centre for research on aliens and UFOs. A crashed alien spacecraft, along with other alien material supposedly recovered from Roswell, New Mexico, is widely rumoured to be stored there. Eye-witnesses have regularly reported seeing UFOs that twist and turn in the skies over the base. The site has made many appearances in films about aliens, including Independence Day. A notorious group of government agents known as the Men in Black are also said to be stationed there to help keep UFO sightings secret.